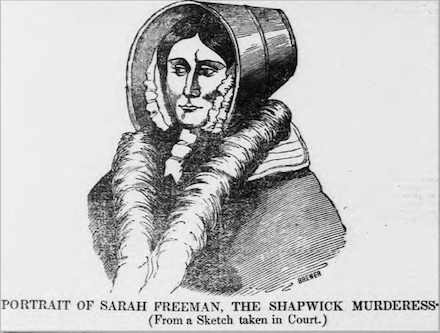 Hanged April 23, 1845 for poisoning her brother Charles Dimond — and commonly suspected to have offed several other family members by means of arsenic — the “Shapwick Murderess” Sarah Freeman insisted her innocence to her very last breath. “I am as innocent as a lamb,” she said to the hangman William Calcraft as he noosed her. 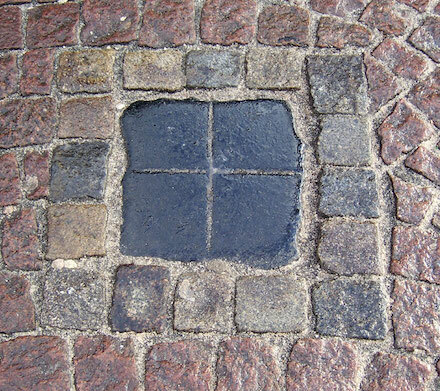 The Domshof town square still holds a spuckstein (“spit stone”) where passersby can revile Gesche Margarethe Gottfried, a serial poisoner beheaded in Bremen on this date in 1831. Ptooey! (cc) image by Jürgen Howaldt. Gottfried wielded the 19th century’s weapon of choice for subtle domestic homicide, arsenic, mixed into spreadable fat, a concoction known as Mäusebutter after its intended legitimate use. This delectable served for 15 murders over as many years in the 1810s and 1820s. The “Angel of Bremen” — so earned for her kindly habit of nursing her victims through the death throes she prepared them — began as is customary with her spendthrift first husband, followed soon by the three children she had by him, her own mother, father, and brother, and her second husband. 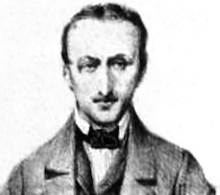 At last one of her proposed victims, one Johann Rumpff who was the husband of the “landlady” Wilhelmine Rumpff already poisoned by Gottfried, became suspicious enough of her to have meals she served to him examined by a doctor, which led speedily to her arrest and to all the rest. 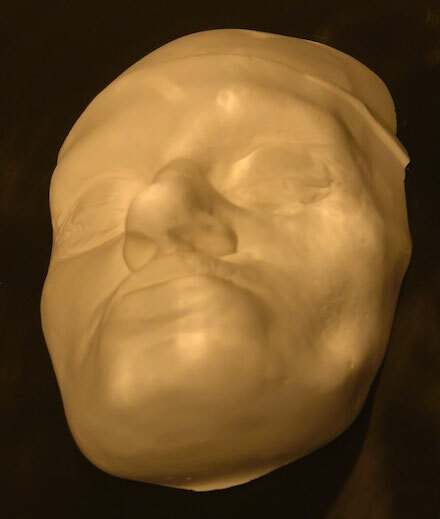 … and for the discerning Bremener desiring to see upon whom their sputum falls at Domshof, the Angel’s death mask can still be gawked at the Focke Museum. (cc) image by Jürgen Howaldt. 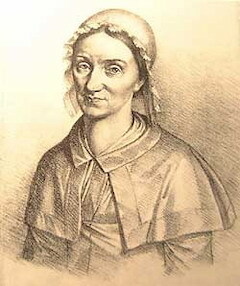 German speakers might enjoy the Life of Poison-Murderer Gesche Margarethe Gottfried composed by her attorney Friedrich Voget: part 1, part 2. or see archive.org. Freymond and his cousin and lover Louise Freymond conspired to murder the man’s pregnant* wife with arsenic. They might have gotten away with this but avarice for the portion of the wife’s inheritance that had redounded to the wife’s sister led them to make a bid at murdering that sister’s beau. This man survived it, and accurately discerned the hand behind his brush with death; his lawsuit led to the literal and metaphorical exhumation of the late wife’s corpse, too. Louise Freymond caught a 20-year prison sentence for this, but Freymond was doomed to lose his head. Switzerland had introduced the guillotine as an alternative beheading method some years before, but the old-school two-handed richtschwert blade still remained available for the hands-on touch you only get with hired goons. Twenty thousand souls turned out in Moudon for the occasion. Heli Freymond was in fact the last person executed at all in Switzerland, for an era: he was still the last when the 1874 constitution abolished capital punishment full stop. However, a crime wave brought the death penalty back in 1879. 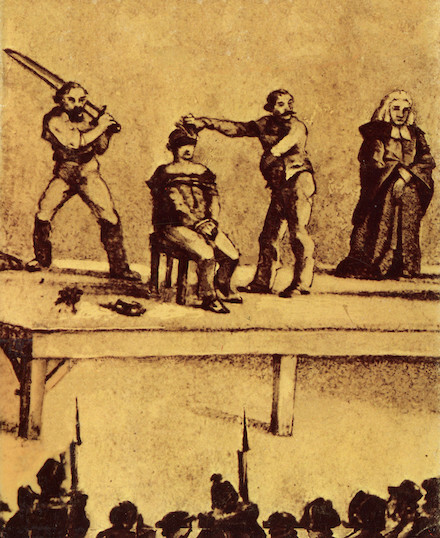 The last Swiss execution for ordinary crimes occurred in 1940; according to CapitalPunishmentUK’s index of Swiss executions, there were 17 Swiss men (no women) shot during World War II for treason. * Technically, an initial unsuccessful attempt to poison the pregnant mother Elise Olivier caused a miscarriage; subsequently, another poisoning brought off Elise, too. 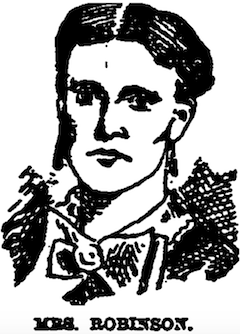 On this date in 1888, Massachusetts almost hanged Sarah J. Robinson. The reader will easily infer from press appellations such as the “Massachusetts Borgia” or “Sommerville Borgia” that Mrs. Robinson was a prolific poisoner. The true toll of Robinson’s career remains uncertain to this day but they monstrously included her own son and daughter — the victims that brought her within the shadow of the gallows. An Irish immigrant, she had discovered the capacity of arsenic for relieving the financial burdens that, then as now, weighed upon the poor. In 1881, her landlord suspiciously died in her care, abating a debt of rent; a few years later, her husband did likewise, leaving her an insurance windfall, and then her sister too. Still the maintenance of five children — four of her own, plus a nephew — harried her. To keep the wolves at bay she moved frequently, sold off furniture. And last, she enrolled two children in a working-class insurance fraternal and collected so speedily to attract the wrong attention. Her many murders afforded multiple bites at the legal apple, so when a jury hung on a charge of murdering her kids, they just turned around and got her for a nephew instead. Notwithstanding her many victims, the prospect of noosing this trembling-hand, rocking-chair mother discomfited the public. The governor commuted her sentence to solitary imprisonment four days before her scheduled November 16, 1888 hanging. The ensuing poem, titled “Melancholy Instance of Human Depravity” and published in an 1805 collection, laments a serving-girl’s murder by arsenic of the master and mistress of her house. It was a crime of unrequited love: the intended victim of the poisoned bread was not this couple but their daughter, whom Sarah Clark fancied a rival for the affections of a young man in her former household. Sarah Clark hanged for the murders on October 30, 1799, in Carlisle, Pennsylvania, but Miss Isabella Oliver was never punished for her verse. Was basely sever’d from its dearest part. And yet her harden’d heart was unsubdu’d. They still are young, and life is worth their care. Weep not, my friends, I cannot die too soon. And join’d with grief, to bow her aged head. And bears them through excruciating pains. Worse than her own, the pangs her children bore. Yet still pursues her own infernal ends. And by degrees puts out the vital flame. What could this hellish cruelty inspire! Why strike at those who no offence had given? It seems like stabbing at the face of heaven! In her dark mind what ugly passions breed! Like gnawing worms, they on her vitals feed. Without an object, what could malice do? ‘Gainst thee, Alvina, she the mischief aims. Thus far thou may’st, but shalt no farther go. What deadly venom rankled in that breast! Tho’ general destruction might ensue! Oh! sin, prolific source of human woe! Ajd is too justly stil’d a vale of tears. Cut off from all communion with their kind. Witness the wretched subject of these lines. Alas! how many suffer’d by her crimes! Who more detach’d, of less import, than she? Yet mark her influence on society. His maker’s image in an unborn race? Could he transmit it whole to sons unborn? Thus poisoning all the mighty mass of man. To prove, the power that made alone can mend. Thy death our ransom, and thy life our guide. And man reflects his maker’s face again. Is sin progressive, spreading every hour? Has heaven-born virtue no diffusive power? But scatter life and fragrance, as they spread. On this date in 1836, two different Englishwomen hanged in Gloucester and Liverpool for seeing off their respective husbands with arsenic. 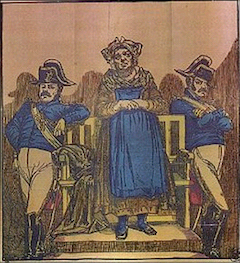 They’re the subjects of an excellent pair of posts by Naomi Clifford, author of such topical-to-Executed Today fare as Women and the Gallows, 1797-1837 and The Murder of Mary Ashford: The Crime that Changed English Legal History, which concerns the long overdue abolition of juridical trial by combat in Great Britain … after an accused murderer used this artifact to escape prosecution in 1817. Clifford makes a triptych here with a third post about yet another poisoner who shared the same fate five days later. On this date in 1789, the Sicilian poisoner Giovanna Bonanno was hanged in Palermo. 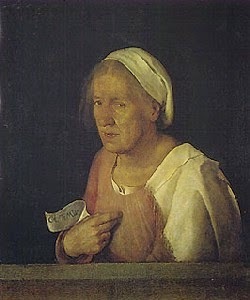 Bonanno (English Wikipedia entry | Italian) had borne the unremarked burdens of the poor into her ninth decade; her life prior to the brush with infamy is all but dark to us save a suspected marriage record from 1744. She seems to have scrabbled her way by beggary and folk magic. For a few years in the late 1780s this vinegar of our latter-day Locusta became the hit choice for the choice hit. It was the ideal concoction: victims couldn’t detect it and doctors couldn’t diagnose it — so dissatisfied spouses, overeager heirs, rivalrous lovers, keepers of grudges, and all other manner of winnowers beat a path to her door. Inevitably this business was betrayed as word got about; although it would surely have occurred by means of some other leak soon enough, in the event it happened when Bonanno’s delivery-woman realized that her parcel was intended for someone that she knew, and warned him. As usual, it was the purveyor who bore the brunt of the law, as suppliers and clients alike damned her for a sorceress as well as a poisoner. Although hanged for her crimes, La Vecchia dell’Aceto — “The Old Vinegar” — entered instantly into Sicilian folklore; Italian speakers might enjoy Luigi Natoli‘s novel of that title. On this date in 1824, John Smith, 25, was publicly hanged before an angry crowd at Lincoln Castle for the murder of his fiancee, 24-year-old Sarah Arrowsmith. John and Sarah had been seeing each other for a long time. Sarah had a three-year-old son by him, and was heavily pregnant with another child. She was under the impression that the wedding banns had been published and they would marry soon, but matrimony was the furthest thing from John’s mind. On December 4, 1823, he bought a pound of white arsenic from the chemist for nine pence, saying he was going to use it for washing sheep. Instead, Smith mixed the arsenic with some flour and gave it to Sarah. She, in turn, baked some cakes with the poisoned flour and served them to her friends for tea. In less than a quarter of an hour, Sarah, her sister-in-law Eliza Smith, her friend and neighbour Mrs. Dobbs, and three children—two of them her younger sisters, and one of them Smith’s illegitimate child with Sarah—all suffered intense burning in their throats and excruciating pains in their stomachs. Several medical men were sent for and, immediately on arrival, the surgeons, Mr. Tyson West and Mr. Pell, set about administering antidotes and emetics. They rapidly had to admit that Sarah Arrowsmith was in a hopeless condition and sent for magistrates to take her deposition from her death bed. Sarah told them who had given her the flour and soon two constables were sent to the cottage where Smith lived in Little Steeping; they arrested him. Smith could surely tell that his goose was cooked, and even as his life hung in the balance there was “an extraordinary apathy about him.” (Storey) Prior to his death he admitted his guilt. It is believed that the other poisoning victims survived.